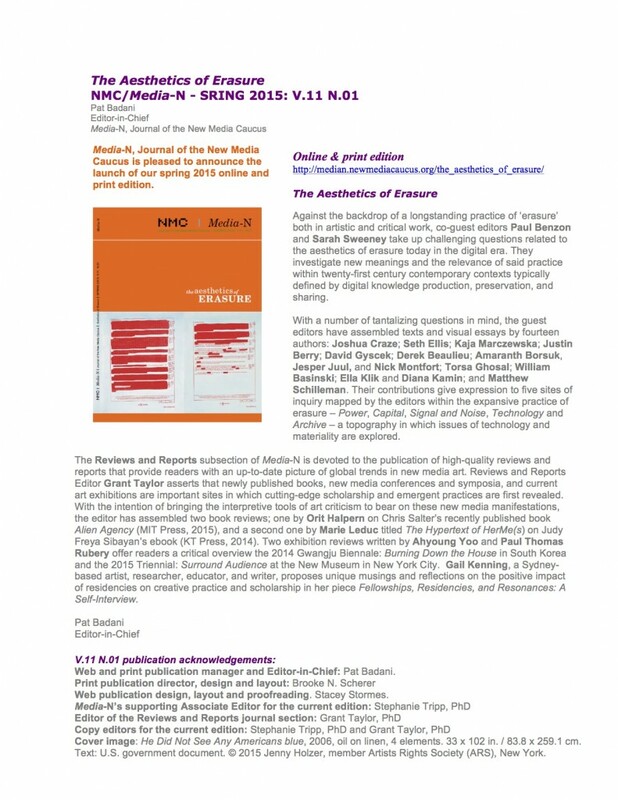 I’m very excited to announce that “The Aesthetics of Erasure,” the special issue of Media-N, the journal of the New Media Caucus of the College Art Association, that I co-guest-edited with Sarah Sweeney, is now out and available in digital and print-on-demand formats! We were lucky to be able to work with a fantastic lineup of artists, writers, and critics across a range of different media to put together this collection—Joshua Craze; Seth Ellis; Kaja Marczewska; Justin Berry; David Gyscek; Derek Beaulieu; Amaranth Borsuk, Jesper Juul, and Nick Montfort; Torsa Ghosal; William Basinski; Ella Klik and Diana Kamin; and Matthew Schilleman—and we’re grateful for the thoughtful and provocative work they all brought to the conversation. And huge thanks to Media-N editors Pat Badani and Stephanie Tripp, whose interest in the project and fantastic, diligent editorial support made it possible. I’m including the official publication announcement below — please read, enjoy, and share with others who might be interested!